Model S150 is with simple design and compact size, yet very reliable and productive. Combination of powerful diesel engine and hydraulic drive makes the machine highly maneuverable and cleaning is easy, no matter the terrain. 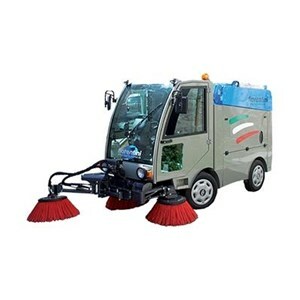 Additional equipment third brush, vacuum hose, high pressure washer, enables cleaning of different objects (waste bins, road signs), maual vacuuming of leafs and other debris, sewage draining, etc. Winter equipment – blade and salt spreader makes S 150 truly multifunctional all-year machines. Operator comfort is a key design feature of the machine. The ergonomic cabin is with heating and air conditioning system and low levels of sound and vibration. Road Sweeper Fiorentini S150 ! IndoTrading.com adalah media iklan khusus Perusahaan, Toko, Distributor, Grosir, Agen, Supplier, Importir, Exportir, Trading dan Pabrik. Jika Anda tertarik untuk membeli Road Sweeper Fiorentini S150 ini dengan harga murah, Mohon hubungi Kontak Perusahaan ini diatas.